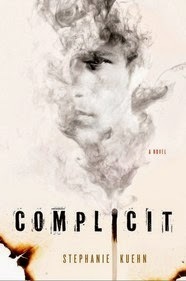 Complicit by Stephanie Kuehn. St. Martin's Griffin. 2014. Reviewed from ARC from publishers. The Plot: Two years ago, Jamie's older sister was sent to juvenile detention. She'd burnt down a neighbor's barn, killing several horses and injuring a young girl who'd tried to save those horses. Rumors have always swirled around Cate: she was that type of personality, that attracted and repelled and fascinated. And now... now she's been released. Jamie is afraid, to be honest. He's put that all behind him, what happened with Cate. What she did. He's been seeing someone to help. He lost his best friend but he's rebuilt his life, flirting with a cute girl at school, continuing to get good grades. What will Cate do, now that's back? The Good: This is the type of book that is so hard to write about! Jamie tells the story. He tells what he knows and what he remembers. And that is the sticking point. Jamie is an unreliable narrator. The story as he knows it, the story as he tells it: Cate and Jamie were the children of a teen mother, struggling to make ends meet. When they were little, about six and eight, she was murdered. Jamie has little memories of his mother, or her death -- just hazy details, of their small basement apartment, of her living on the edge, the type of life that led to her death. And then the miracle: after months in the foster system, Cate and Jamie were adopted, kept together, by a rich couple who were looking for older children to replace the ones they had lost. At first, young Cate is the one who seems to adjust easily, being happy, taking riding lessons. It's Jamie who is lost and sullen and doesn't quite connect, until he's sent to a therapist and things get better and Jamie gets better. Like the lost son, he takes piano, He calls his adoptive mother "Mom." When Cate enters her teen years, things change. Jamie, the younger brother, looking on, doesn't understand why but suddenly Cate is the trouble maker, pushing boundaries, drinking, smoking, boys, and then, of course, the barn fire. And now she's back, reaching out to Jamie, and acting as if there's more to the story. That there's more that Jamie knows. Jamie wants to know what she knows. That's the story Jamie is telling us. Between the lines, though, the reader sees another story. Of a lost child. Of someone who has learned to act the right way, to give the right responses. Of the growing concern that part of Jamie's acting the right way includes what he is, or is not, telling the reader. Of trying to figure out how much of what he is saying about Cate is real. And of trying to understand Jamie, and who he is, and what he's done. This is a suspenseful, psychological drama about a mentally ill teen. Who that teen is, and what they do, is a question that will leave the reader guessing. A bit of a disclaimer: this is the type of book that I only like when done well. Unreliable narrator, unlikable characters, questions left for the reader to answer -- I am so picky about these things that usually my short-form response is that I don't like these things when the truth is that I do like them, I'm just very particular about how such books are crafted and written. And Kuehn in Complicit? Does it so well it's a Favorite Book of 2014. >>Unreliable narrator, unlikable characters, questions left for the reader to answer -- I am so picky about these things that usually my short-form response is that I don't like these things when the truth is that I do like them, I'm just very particular about how such books are crafted and written. Ha! I feel the same way, but I tend to err in the other direction -- to say I like these things -- even though the majority of authors that try them don't please me. I keep saying I like them because when they're done well, they're one of my favorite things. I'm excited to pick this up! I was so glad to meet her at KidLitCon - she came to dinner the first night - and I choked, of course. I was going to exclaim over her brilliance and instead I babbled on about nothing in particular. Seriously, though, her books are SCARY good. Usually unreliable narrators also come across as unlikeable for me - but this guy. THIS. GUY.